Some time back, a gallerist friend of mine asked: “What are artist residencies?” It is a question that is asked often. Residencies are studio spaces of varying sizes to which writers, performers, dancers, artists and scientists are invited to live and work, mostly for a short period of time. A normal residency has living facilities and work spaces. Residencies provide creative professionals with connections and an audience. Residency programmes are never the same. Each programme or guest studio, large or small, established or experimental, has its own background and atmosphere. Working periods differ enormously: from two weeks to six months, sometimes even a year or two. Some specialise in one discipline, others are interdisciplinary. I have participated in some fabulous artists residencies to work, learn and live. One of them, called Headlands Centre of Visual Arts, was at Sausalito—a city in California, across the Golden Gate from San Francisco. I would like to use this space to talk about a few people behind such spaces. One of them is Alexie Glass-Kantor. I met her a few years ago at Art Basel Hong Kong. She has been the curator for the large-scale installations called Encounters at Art Basel in Hong Kong. I had attended her moderated talk sessions called Conversations during the event. She is a fluid, articulate and prolific speaker, a great conversationalist and an inspiring moderator. During our trip to Australia, we met her at Artspace [art gallery in Sydney] during the professional preview. She has been the director of Artspace for the last four years. She has a great team and spirit to run such spaces. Support comes from state agencies like Australian Council for the Arts (ACA). In fact, the artists’ studios or cultural institutions in Australia are mostly funded by the ACA. It also coordinated the Meet the Artists programme for visiting international curators at Artspace, and other venues such as Carriageworks Studios, Parramatta Artists Studios and ACE Open in Adelaide. We went through a lot of good artists’ presentations. At the Gertrude Contemporary in Melbourne, we heard and saw Sangeeta Sandrasegar. Her works are extremely minimalist and conceptual. Now, we are also looking forward to welcoming Alexie to Kochi soon to continue our artist and studio exchange programmes. It would also be an opportunity to learn her administrative and multi-tasking abilities. ACE has some good exhibition spaces and had a good show by ten Muslim artists—part of the Australian Muslim artist collective, Eleven. (The collective was initiated by Tripoli-born, Sydney-based artist Khaled Sabsabi. I had showed his works at the Yinchuan Biennale 2016 and Sudarshan Shetty invited him for the Kochi-Muziris Biennale 2016. In fact, Khaled was everywhere: Biennale of Sydney, and ACE and Samstag Museum in Adelaide.) ACE has also set up a few new studio spaces. There are a lot of complimentary spaces that are also used by ACE, like Jam Factory Contemporary Craft and Design, a fantastic foundry for blown glass and ceramics. It is a lovely exhibition space and has a cool design shop, everything produced by artists or designers. Riyas Komu, director of programmes, Kochi Biennale Foundation, and ACE’s CEO Liz Nowell and reputed curator Natalie King had a meeting for long-term relationship building between Kochi, Adelaide and Melbourne. Within a minute’s walk from ACE is the Samstag Museum. It was a great feeling to ruminate on the works of some of our KMB artists. One of them was Angelica Messitti, who participated in the 2012 edition. She will be part of the Australian Pavilion at the Venice Biennale 2019. I have a lot to write about our visit to Australia, but here I would like to inform you about a fairly new space called Victoria College of Arts at the University of Melbourne. 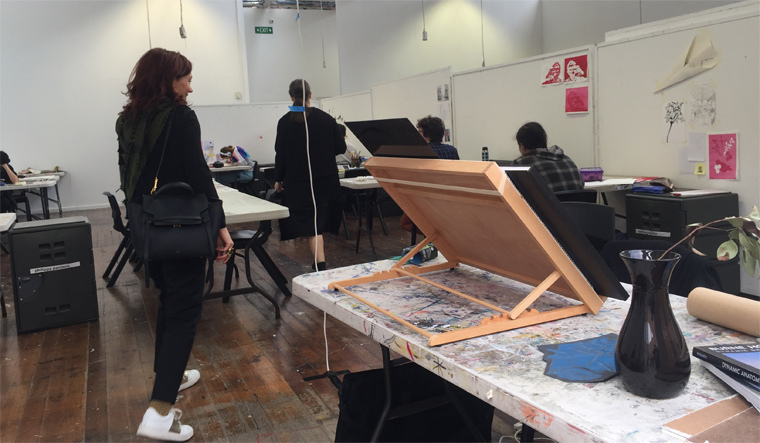 Vikki Mcinnes, the managing editor of the art journal Art +Australia and an independent curator, and Natalie gave us an enlightening walk through the students’ studio spaces, workshops, graphic studios, space for conversations and the gallery next door, the Buxton Contemporary. There were three eminent people during our short visit at the university—Vietnamese artist Tiffany Chung, curator and historian David Elliott and our own artist N.S. Harsha. They were there as guest tutors. I wish our students also got such opportunities, patronage and infrastructure like studios, galleries, libraries, museums, parks and gardens.